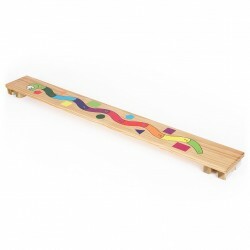 Natural Timber plank with a snake graphic incorporating numbers and colours for cross curricular activities. Battens with non marking rubber pads at both ends to allow for a variety of linking options. Dimensions: 1830mm long x 210mm wide x 90mm high. Weight: 6.2 kg.